It tries to look at the clicker genre with different eyes (skill tree instead of endless purchases). It also comments on Loot Boxes and how we're addicted to something as stupid as clicking and leveling up, and getting random loot. Breaks the fourth wall - with some descriptions. About Gaming Culture - comments on Loot Boxes and the recent events around them. Genre Deconstruction - Clicker/Incremental/Idle genre with twist (I tried). Game Parodies - Included references to loot box games. I used a pixel font I made a few years ago. I also used my MykaelosUnityLibrary which is just a pile of random code and extensions that make it easier to get a unity project working. All other code was written from scratch. Art was created new for the game. It's pretty unfinished, but I think you'll get the gist of what I was trying to do. I'm still working on it, with plans to release it to Google Play at some point. Quite enjoyable. :) I appreciate that while it uses clicker mechanics, it remains short and to the point. The fact that coins give access to the end of the game is as well a nice commentary on loot boxes as a good way to avoid losing players' time! I love this thing. I want more, I want this to be my life. I like the commentary on the addictive nature of this. It is silly that I feel the need to get all the items even though they don't do anything for me. I agree that the game could use some sound effects, but I liked it as it is. If you had sound Fx I wouldn't be able to tear myself away from this. Quite a fun little commentary on clickers and loot boxes but almost confirms why they are so popular because even this dumbed down "game" was quite addicting and satisfying. I feel like the interface was a little bit lacking, some of the upgrades could have been done with fewer clicks and unlocked/locked things could have been highlighted better. Also I would have preferred to be able to tell easier when one of the loot box rewards was one I didn't have already. 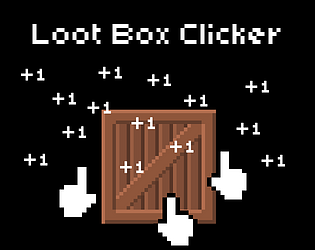 A very clean, satisfying and fun loot box clicker. As for the loot box rewards, there is a "Duplicate" message that appears for ones you've already collected, but I agree that I need to add something else to point out the new stuff. There's a lot of juice missing right now. Thank you so much for playing, and the feedback!